Even though your home may be smaller, it still needs to be safe. Safety precautions may help you save your property and maybe even your life! 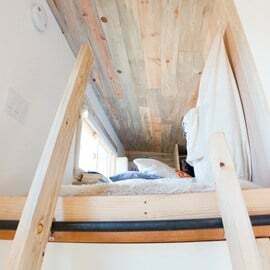 Editor’s Note: This post has been provided by our friend Gary Bute of Tiny House Systems. Gary has decades of building experience, and has personally lived in small dwellings on and off throughout his life. He’s an expert at electrical design and offers all kinds of tiny house design services. Thank you, Gary! I’ve added my own photos and captions to help illustrate some of Gary’s important tips. When considering how to build a tiny house, safety is never something to overlook. 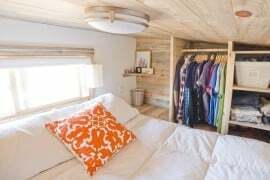 Those of you building a tiny house may wish to consider these safety features and preparations. This is a basic item that has saved lives for decades — one that must be installed in every home. Install a smoke detector in the location(s) according to the manufactures directions. Smoke detectors have a life span of 8 to 10 years according to the manufactures, so replace the entire unit accordingly. With the tight construction of small dwellings to save energy, CO poisoning becomes an even bigger threat. Install a detector with alarm according to the manufactures directions. Combo smoke/CO detectors can be used to cover these two major requirements in one unit. Propane is an explosive gas that is heavier than air. If leaking, it accumulates at the floor level and then fills the room. If a spark occurs the gas will explode, just like natural gas. A propane detector will alert you at the first sign of propane buildup. The detector should be installed near floor level, according the manufactures instructions. A system could be installed to turn of the gas at the tank source if the smoke, CO and /or gas detectors are triggered. This same systems could also turn off the electrical power and send you a text notification of this situation. Have a hand held bottle of sufficient size and rating to respond quickly to a fire. This is excellent low cost self-insurance. Keep the extinguisher in visible sight for others to use without looking to find the bottle. You may want another extinguisher outside for the campfire or vehicle fires. This is an organic fluid that may be applied to unfinished wood surfaces to reduce flame spread. This is a system that will emit an organic fluid to extinguish a fire after detecting the heat. It’s not just water and is used for computer server rooms. Provide a window to escape your tiny home if your door is not accessible. When sleeping in the loft, this means having a large enough window (or skylight) that you can escape from very quickly during a house fire. Consider an exterior ladder to get down from the loft window in the event of an emergency. 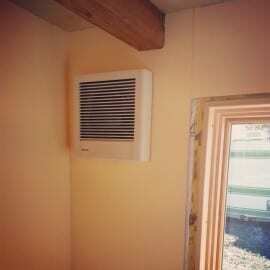 Monitoring the oxygen level in your tiny house is very important since most small home are very air tight. Open a window when any exhaust fan is operating to provide a fresh air source to be exhausted. An exhaust fan is an important component to maintaining good indoor air quality. It also helps alleviate moisture buildup, protecting your house from mold/mildew and rot. Always run an exhaust fan when cooking on a propane stove, or during the burning of any combustible gas. Our exhaust fan is located in the bathroom, but is also used to pull out cooking fumes when using our propane range. Do not vent a gas/propane water heater unit below an operating window. Vent your waist water piping and storage tanks, if any, to above the roof as these may be explosive gasses. Provide the proper landing and stairs to depart your tiny home quickly even in the dark. Stairways should have uniform stair tread heights. Have basic medical products available for quick emergency procedures. Know where the closest emergency room services are located and the number to call if you need them to come to you. Know the location of your home to inform first responders in the event of any emergency. Have the location of your home clearly marked for emergency personal to find you quickly. Our tiny house is built on a heavy-duty flatbed trailer, rated to tow 10,000 lbs. If you are building a tiny house on a trailer, you are required to have electric brakes on the trailer. These brakes are activated if the trailer becomes detached from the tow vehicle. This is required in every state, however, the gross weight of the trailer requiring brakes varies. Test the brakes before moving the trailer. 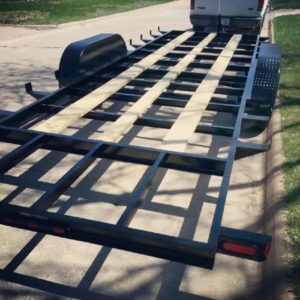 Select a trailer, including the tires, with the proper load rating. Make sure that the tow vehicle is also rated to tow the trailer weight. Learn construction safety and instruct casual helpers to work with the proper personal protection. Watch your helpers to avoid disasters especially when operating power tools and on ladders. Install framing, electrical, plumbing, gas distribution, heating, air cooling and ventilating products according to applicable codes. Just because there is not a government agency regulating your home building that doesn’t mean you should skip these code requirements. Safety for power and water starts at the source so verify what you are connecting your home to before issues are discovered by accident. Never store propane inside of any closed area. Exterior enclosures for tanks must be open on the bottom to allow propane gas to be vented down. Safety in not an accident — always make safety #1 during and after construction! ← Open House this Sunday (7/13)! Thank you! I’m now planning my TinyHouse build and you have given me great information! The outward swinging door helps prevent break-ins and a steel frame does it even better. Would love to hear some inexpensive ideas for preventing theft of the whole vehicle. Every house I’ve lived in has inward swinging doors to keep the hinges in the secure area. Correction: the danger is not CO2, which is carbon dioxide but CO, which is carbon monoxide. CO2 is only dangerous if you use up all the available oxygen. CO2 is a normal by-product of human respiration. Carbon monoxide (CO) is the tasteless, no smell, silent killer. Thanks, Moose. I fixed the typo in the article. Shame on me for not catching that the first time through! 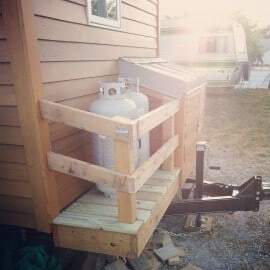 I see the photo of the storage over your hitch for your propane tanks and a small compartment. What’s in the compartment? I’m currently trying to figure out where to place my utilities – propane hookup, electrical box, on-demand propane water heater and AC mini-split condenser, and I had thought I’d store them all at the end of the trailer in the same spot. However, I’m now worried about propane storage being near electrical. Think that’s a valid concern? That storage compartment is just used for tools, building materials and other misc “shop” items that don’t need to be in the house. We have our hot water heater and electric panel inside for easier access and to keep from freezing outdoors. There would only be a concern having your propane tanks and electrical near each other if 1) You have your propane tanks in an enclosed area where any leaking propane could pool up 2) There was no separation between the two. If you did want to use an outdoor shed area like this for the other utilities that would be fine as long as the propane tanks are on an open deck with plenty of air and no enclosed bottom (propane is heavier than air). If you then have electrical item in a separate enclosed shed that is safely separated from the tanks, I think you’d be safe. but I’m not an expert on this. Might want to see if there is an RV manufacturer in your area that you could ask — they’d have more experience with this than a normal home builder. Thanks for the article! I’ve been watching a lot of Tiny House Nation lately since I am interested in building my own “small” home. I swear I saw a permanently bolted loft ladder completely blocking the electrical access box on the wall on one of the episodes. Then it got me thinking.. Are those windows in the loft egress windows? What happens if there is a fire? And well a snowball effect happened in my tiny home research. I’ll admit that my background in architectural design and codes may make me a bit biased, but I don’t think the building codes were created just for funsies on “regular” sized homes. It’s about safety, not just simply rules to follow. Thanks for the tips! Yes, there are some great tips I did not think about. I thought about egress but not a propane detector and I didn’t know it was heavier than air and auto-shutoffs were available. This article a good extension of common sense. I currently undergoing a tiny house build. From your article I am understanding (correct me if I’m wrong) that the vent for the drain line cannot be near the vent for the propane. In the current system I have for the inside my drain line are a foot away from each other. Could I vent the propane out the wall and the drain line out the roof to avoid this issue? One more question, my water system is greywater, do you think that I need a drain line vent with a greywater system? From what I have found I could do without a vent for the drain line but it would affect the speed of my drainage, is this true? Hi Melanie. I am not a plumbing expert, but I think, yes, in a small house you can probably get away with no drain vent. It may be slower and you may occasionally hear some gurgling as air tries to make it way into the pipes through another drain, but it should be fine, depending on how your plumbing is designed. I did that in my house, actually. Or vent it out the roof just to be safe. The propane vent is really only a concern if it’s next to a window or a fresh air intake as you don’t want to pull that propane exhaust back into the house. Having said this, I’d probably ask an actual plumber to be sure! We have a hardwired RV-rated combined CO and LP detector in our tiny house and it keeps going off! We aren’t smelling any gas and we even have had windows cracked. We are living off solar power so I’m wondering if maybe the variable energy coming from the solar panels damaged the detector? Or do we not have proper ventilation? Any advice would be greatly appreciated.